Whilst ringing at Alba Marsh last weekend we caught two shrikes in the mist nets. Luckily for me I was not around to extract them and my fingures were saved. 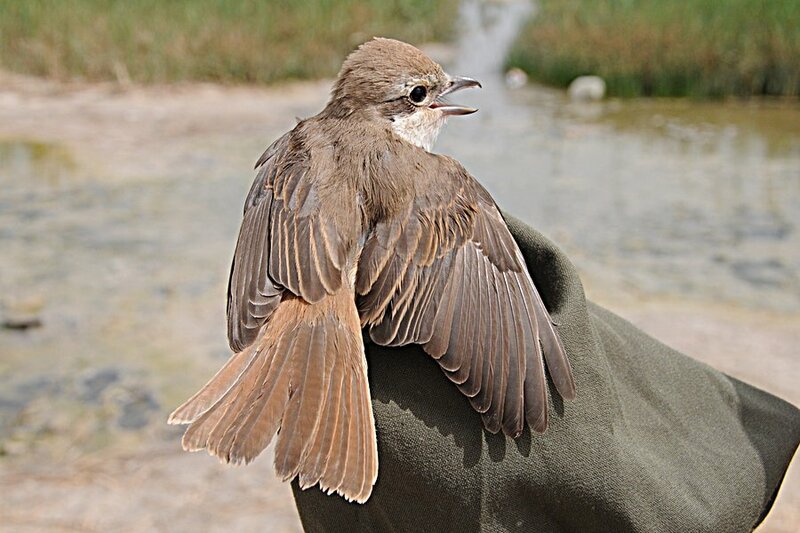 I was, however, able to ring both birds and Turkestan Shrike was a new ringing species for me. 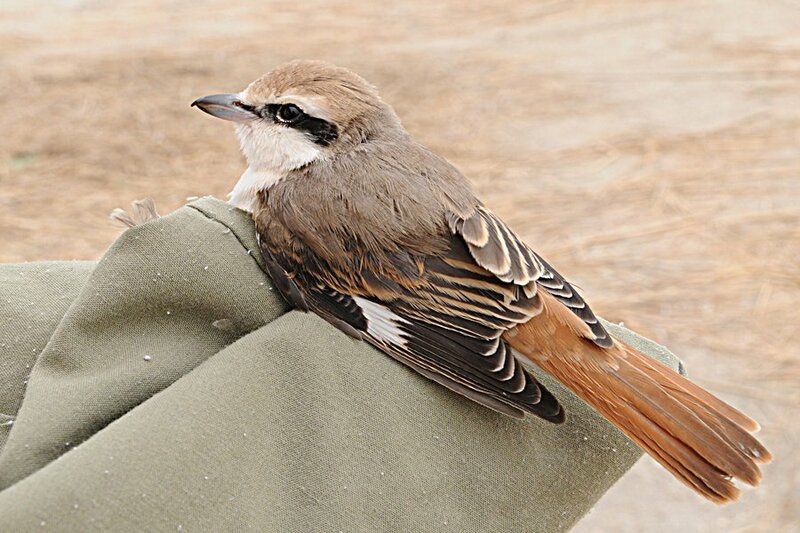 The Daurian shrike was a female type and the Turkestan Shrike a first year male. There are plenty of shrikes around at present in Saudi Arabia and Bahrain so it was not too surprising we caught a couple. 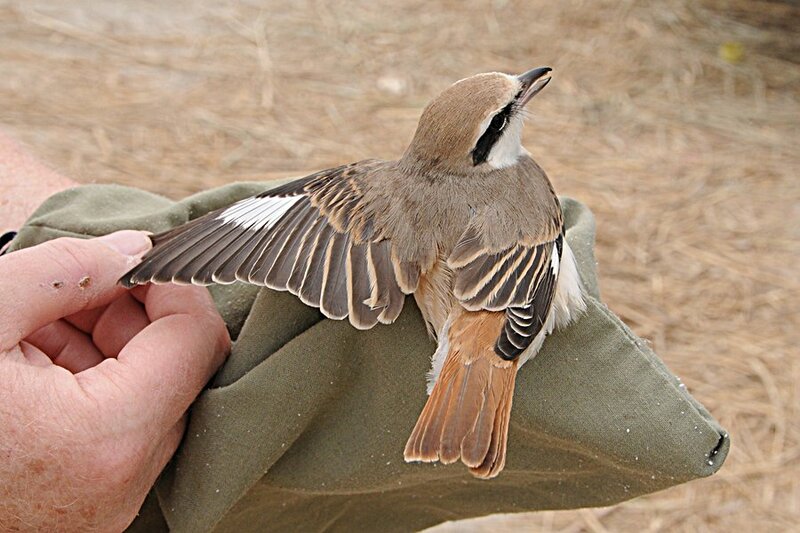 The Isabelline Shrike (Lanius isabellinus) was previously treated as conspecific with Red-backed Shrike L collurio (Vaurie, 1959) or with both Red-backed & Brown Shrike L cristatus (Dement’ev & Gladkov, 1954). Until recently, it has generally been treated as a separate species comprising four sub-species: two, phoenicuroides and isabellinus breeding in central Asia and migrating southwest, wintering in Arabia and NE Africa; two other subspecies arenarius & tsaidamensis, breeding in North China and are shorter distance migrants, wintering in Pakistan and NW India west to Iran. 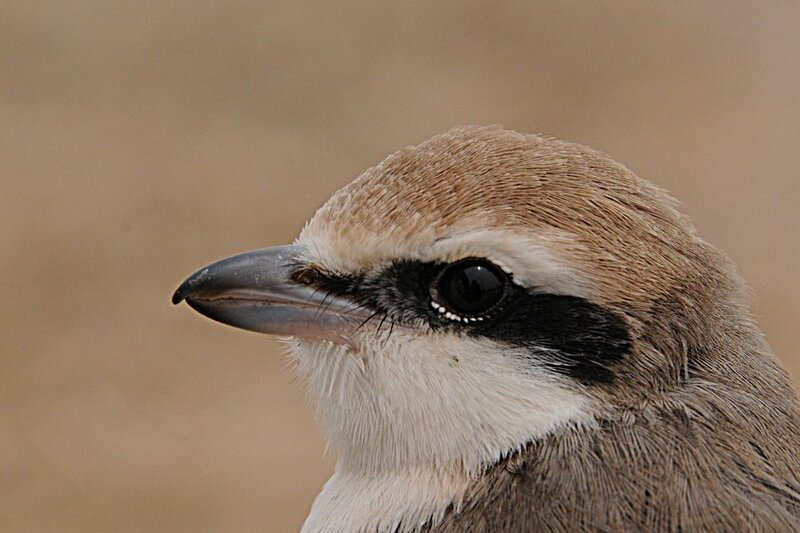 Another proposal by Russian authors who have been studying these birds within their breeding ranges for years, is to consider this taxon as two independent species: the Isabelline Shrike Lanius isabellinus and Turkestan Shrike L. phoenicuroides (Korelov 1970, Panov & Kryukov 1973, Kryukov 1995, Panow 1996). This view was adopted in a new checklist of Russian bird species (Koblik et al 2006), which was compiled to improve on previous lists by Stepanyan (1978, 1990). This Russian thinking has recently been adopted by the Dutch committee for systematics (CSNA) who "split" the "isabelline" shrike complex into three species in 1998 (Sangster et al, 1998). This was based on the grounds of "qualitative differences in morphology and analyses of their contact zone" and "vocalizations" (Sangster 1998). They name them as follows: L isabellinus (formerly speculigerus), Daurian Shrike, L phoenicuroides, Turkestan Shrike; L arenarius (formerly isabellinus) and tsaidamensis, Chinese Shrike. 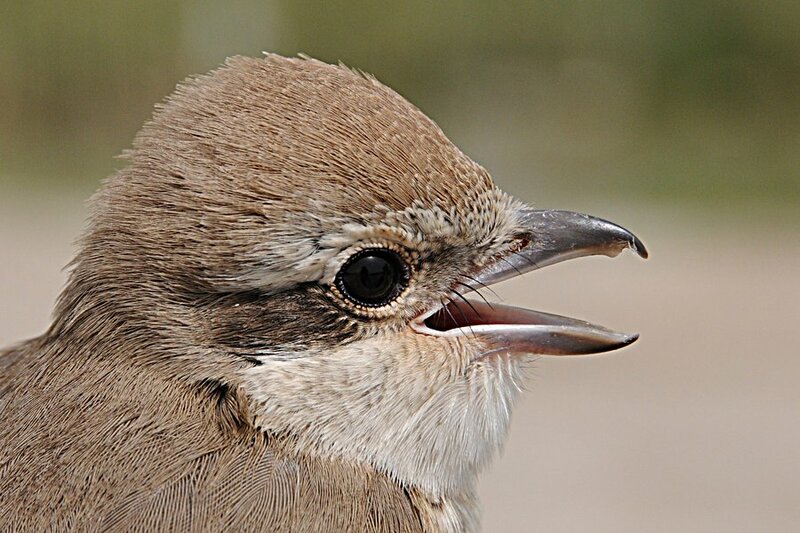 Nice shots, particularly the DaurianFem showing a pronounced 'notch' on the upper mandible not unlike a Falcon.